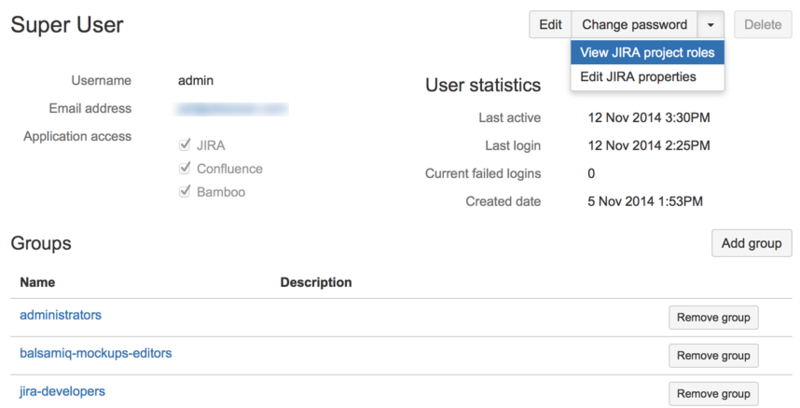 In this update, we'll be re-introducing the ability to view and edit JIRA user properties into your user management capabilities. Just as you could previously, you can add data to user properties in order to integrate with other add-ons, such as JIRA Misc Workflow Extensions or Tempo Timesheets. You can also view and edit the project roles for a specific user from the user management screens. You can access these feature from the drop-down available in a user's detail screen. In addition to this change, we've also combined the "Create user" and "Invite user" functionality. To add a new user, click the Create users button and enter the email addresses of the users for which you'd like to create an account. Usernames will automatically be generated based on users' email addresses. New users will be sent an email to set their password. Note: The license count is updated when you create the user (not when the user logs in), so creating users takes a license for each application you give them access to. Is your team already using HipChat to collaborate? We've made it super easy to connect Confluence to HipChat. Go to > General Configuration > HipChat Integration and click Integrate with HipChat. You'll need to be an administrator in both Confluence and HipChat to do this. Once you're connected you can then send notifications about space activities, like new pages and blogs, directly to your team's HipChat room. Go to Space Tools > Integrations. HipChat is team chat that's built for business. Not using HipChat yet? Sign up today - its free! 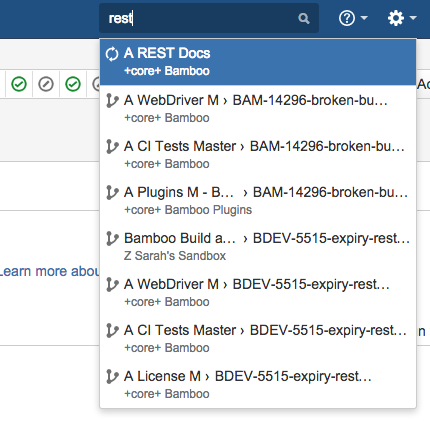 We're continuing to improve how Confluence works with files. In this release we've got some great new goodies. Preview PDFs – It's now possible to preview PDF files without leaving your page. Simply click a PDF link on a page; there's no need to download the file first. Upload a new version of a file – You can now upload a new version of an image or PDF file right from the file preview - even if the new version has a different file name. Preview an image or PDF then click the Upload a new version button. If someone else edits or makes a comment on a page you're viewing, you'll see a quick reload notification letting you know that the page has changed and giving you the option to reload the page or show the comment. To make sure you don't miss any important updates, we've moved the notification to the top-right of the page where it's more prominent. This is a bugfix release and the following issue is fixed. Note, this release is essentially the same as JIRA Agile 6.6.13, which was released for JIRA Server customers. We've improved searching in Bamboo. Now, Bamboo suggests search results as you type the name for build plans or deployment projects. Use the '/' (forward slash) shortcut to shift focus to the search tool from any page in Bamboo. We've made variables much more useful in Bamboo. Now you can pass values between stages and from a build plan to a deployment project. You can also inject values from a file, and print build variable values to file. Even better, you can control the scope of those variables. If you give them local scope they cease to exist when the job finishes. If you give them result scope they persist and are passed into subsequent stages or related deployment releases. Now it's easy to use Bamboo to get continuous integration and deployment for your Node.js projects. Bamboo has new Node.js tasks you can use to run your Node.js scripts and applications. There are tasks to let your build plans interact with npm, Node.js, Mocha, nodeunit and Grunt.